It really is close enough to just call this year done, isn’t it? …since my last post was my wedding day. In February. Oops. Just a reminder that you can also follow my shenanigans on the Facebook page. Just a couple weeks away, you will find me in Albion at Stirling Books. There will be six authors in total and should be a good time for all. Horror, romance, fantasy, all ages, get your read on! The Monroe County Library System is hosting Writers on the River 2018. I will be there with a literal horde of authors, and you should join us! Authors from all walks (including a couple of my favorites) will be representing their books. This may be one of the last chances for you to get something wonderful for your favorite reader before the holidays are upon us. The lovely people at the Scriptorium in Clawson have given me the opportunity to take over their delightful store for the afternoon. I’ll have my books on hand, and who knows what else will be happening that day, but I will be there and you should join me. At 2pm, I will be turning my reign of the store over to the imagination and talent of Andrew Lark. It would only benefit you to stick around and get his book too. THIS IS MY LAST APPEARANCE IN 2018. And for those of you who have patiently waited for my next novel, I can tell you now: The wait is almost over. Between now and then, I will be looking for a handful of brave souls to be my advance readership to make sure the book is ready for the general public. If you are interested, reach out and let me know. I’m looking for a few dedicated readers, and you may be expected to respond to a survey after, but you will be rewarded as well. More on this in the future. I will have a short preview of Threshold at all of my November events for you to take home and hold close. A hope to cling to through the winter, if you will. Now also seems as good a time as any to shamelessly promote my wife’s constant and reality-defying ability to take my stray and problematic storytelling and turn it into something people can actually enjoy. She’s worked with a number of wonderful authors and is always interested in meeting more delightful authors to work with (more work means more reading, right?). You can find out more at Just Ducky Editing. Get your costumes in order, put out your jack o’lanterns, and get yourself settled in. It’s going to be a dark and stormy night around here. The best time to settle in with a supernatural tale. For those of you who have pre-ordered, you should already have it in your Kindle library. For those who didn’t, it’s far too late. Fortunately, House of Thirteen is available in paperback and ebook right now. Enjoy – and Happy Halloween! It’s been awhile since I’ve done an event. I have to say, I’ve missed them. They are a lot of fun, on both sides of the table. I love talking to people who stop by the table, whether they want to talk about my books, the magic of idea crafting, or the art of writing itself. I also really enjoy my boothmates. An event is really only as much fun as the people you surround yourself with and this time around, I’m pulling out all the stops. September 13, in the Kerrytown district of Ann Arbor is the 13th annual Kerrytown Bookfest. Not only will I be there, but I will have books, and merchandise, and ye olde Bad Drawings sketch pad. I’ll also be sharing my space with fellow author J. Thomas-Like, who will also be offering her wonderful words to the masses. And right next door, I’m proud to say we’ll be neighboring with Kate of ChicalooKate – it promises to be some awesome fun YOU should be a part of! 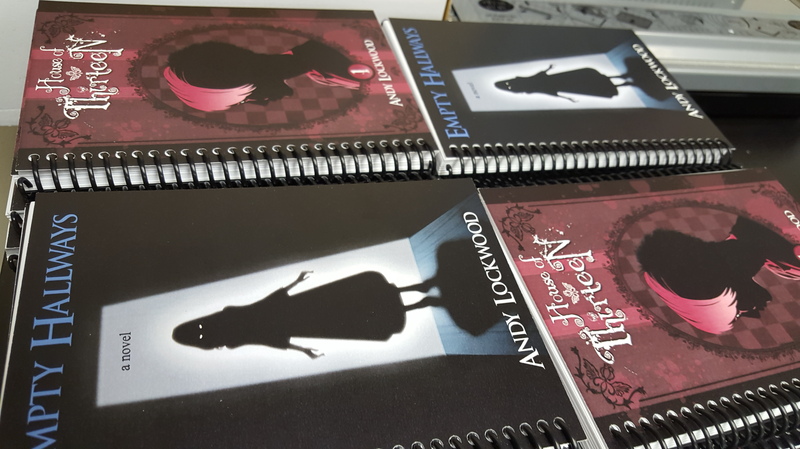 I don’t want to ruin all the surprises, but I will say that this is the first time you will be able to purchase Empty Hallways and House of Thirteen notebooks and magnets! Glorious notebooks for all your writing wonder! Let the FCC hear you.